Capital Cooking with Lauren DeSantis: Free Event: Register for the 5th Annual Chile Chef Challenge! Free Event: Register for the 5th Annual Chile Chef Challenge! Next Week! The Ambassador of Chile, Alfonso Silva Navarro, Foods from Chile & RAMW are putting on the 5th Annual Chile Chef Challenge! Food & Cocktail Battle. 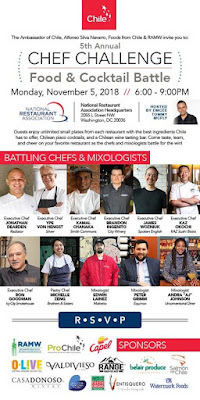 On Monday, November 5, 2018, from 6-9PM at the National Restaurant Association Headquarters DC Chefs and Mixologists will battle it out – and you get to decide what restaurants are your fave! This event is free, and you can register here. Guests will enjoy unlimited small plates from each restaurant with the best ingredients Chile has to offer, Chilean pisco cocktails, and a Chilean wine tasting bar. You don’t want to miss this fun event! 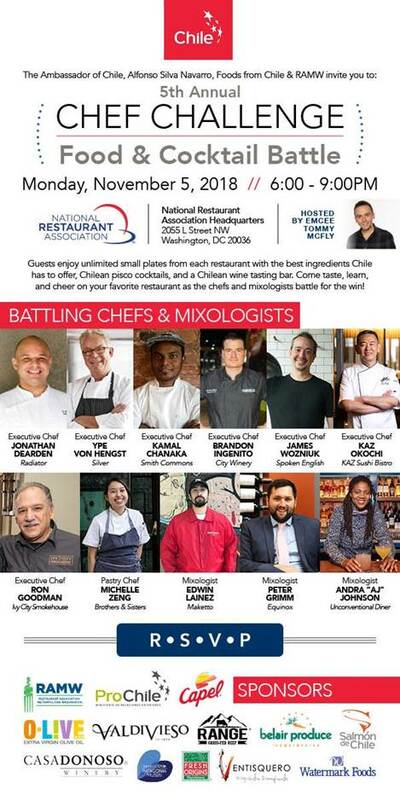 Come taste, learn, and cheer on your favorite DC restaurants, chefs, and mixologists!